Mr. Mouse is taking Mrs. 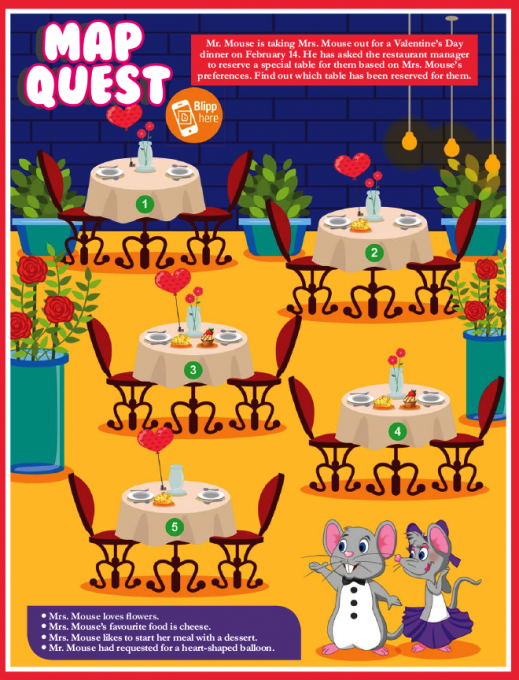 Mouse out for a Valentine's Day dinner on February 14. He has asked the restaurant manager to reserve a special table for them based on Mrs. Mouse's preferences. Find out which table has been reserved for them. On World Autism Day, monuments around the world are lit up in blue. This year, electrician Pinto has been told to light up a monument. But he's forgotten which one. Help him identify the monument he has to light up. The flight is about to take off but one passenger is yet to board. Help the airline staff identify the passenger using the clues given below.